This article is about Cornwall (disambiguation). For other uses, see Cornwall, Connecticut (disambiguation). Cornwall is a town in Litchfield County, Connecticut, United States. The population was 1,420 at the 2010 census. Cornwall was incorporated in May 1740, and was named after Cornwall, England. According to the United States Census Bureau, the town has a total area of 46.3 square miles (120 km2), of which, 46.0 square miles (119 km2) of it is land and 0.2 square miles (0.52 km2) of it (0.54%) is water. The town is located on the east bank of the Housatonic River and also contains a major portion of the Mohawk State Forest. As of the census of 2000, there were 1,434 people, 615 households, and 389 families residing in the town. The population density was 31.2 people per square mile (12.0/km²). There were 873 housing units at an average density of 19.0 per square mile (7.3/km²). The racial makeup of the town was 97.49% White, 0.21% African American, 0.70% Asian, 0.21% from other races, and 1.39% from two or more races. Hispanic or Latino of any race were 1.46% of the population. 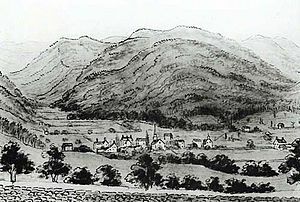 A sketch of the village by John Warner Barber (1835) shows the buildings used by the Foreign Mission School, to the right of the church at center. There were 615 households out of which 29.4% had children under the age of 18 living with them, 52.5% were married couples living together, 8.5% had a female householder with no husband present, and 36.6% were non-families. 30.7% of all households were made up of individuals and 12.0% had someone living alone who was 65 years of age or older. The average household size was 2.33 and the average family size was 2.93. In the town, the population was spread out with 24.4% under the age of 18, 3.3% from 18 to 24, 25.7% from 25 to 44, 28.9% from 45 to 64, and 17.6% who were 65 years of age or older. The median age was 44 years. For every 100 females there were 94.0 males. For every 100 females age 18 and over, there were 90.5 males. The median income for a household in the town was $54,886, and the median income for a family was $64,750. Males had a median income of $46,875 versus $30,536 for females. The per capita income for the town was $42,484. About 1.0% of families and 3.0% of the population were below the poverty line, including 3.0% of those under age 18 and 1.6% of those age 65 or over. Some of the main features of Cornwall include the Cream Hill Lake, the Covered Bridge, Mohawk Ski Mountain and the town which contains a library and tennis courts. It is a very enjoyable place for young children who enjoy activity. The Cornwall Library , organized in 1869, constructed a new building in 2002 that houses a collection of over 28,000 items. It also sponsors a long-running art show along with many other events. The Cornwall Chronicle  is a non-profit monthly newspaper that publishes news and feature stories about Cornwall, a calendar of events, and drawings by local artists. It was started in 1991 and has not missed an issue since. Cathedral Pines - a 42-acre nature conservatory and old growth forest. Cornwall Bridge - built in 1930 and listed on the National Register of Historic Places in 2004. Cornwall Bridge Railroad Station - added to the National Register of Historic Places in 1972. Cornwall Historical Society - located in a converted carriage barn, features annual exhibits on Cornwall's history. House VI ("the Frank residence") - an example of Deconstructivist architecture. Mohawk Mountain Ski Area - a ski resort. The town was also home to the Foreign Mission School. The fictional private boarding high school Cornwall Academy from the 1999 film Outside Providence is located in Cornwall, Connecticut. In the eleventh episode of the second season of Supernatural, Sam and Dean Winchester explore a haunted bed and breakfast in Cornwall. In Season 4, Episode 11 of the television show Gossip Girl, Juliet Sharp returns to her hometown of Cornwall, Connecticut. Cornwall, Connecticut Facts for Kids. Kiddle Encyclopedia.